The cornea is the clear front part of the eye. A thin layer of tissue called epithelium is the cornea’s protective outer layer. The inner surface is called the endothelium and the portion in between is called the stroma. A corneal abscess occurs when bacteria or fungus along with the animal’s own white blood cells enter the cornea through an injury. The injury may heal too quickly and essentially “seal” the bacteria or fungus inside the cornea creating a pocket of infection or abscess. Abscesses may also be sterile, with only white blood cells present. A horse with a corneal stromal abscess will have a dense white or yellow spot in the cornea representing an accumulation of organisms (bacteria or fungi) and/or white cells. The eye may be cloudy and red with varying levels of ocular discomfort, which may manifest as tearing and squinting of the affected eye. A corneal stromal abscess may weaken the cornea to the point of perforation of the eye, with the possibility of subsequent blindness. It is also possible that the abscess may spread to the inside of the eye causing severe intraocular inflammation and infection, which also may be vision-threatening. Corneal stromal abscesses are treated intensively with medications prescribed by the veterinary ophthalmologist. The ophthalmologist may remove the corneal epithelium covering the abscess to increase penetration of medication into the lesion to hasten the healing process. Medications may need to be continued for several weeks to several months. Surgical intervention is occasionally necessary to remove the organisms (bacteria or fungi) and prevent rupture of the eye. These surgeries can vary depending on the depth of the abscess and occasionally utilize a corneal or conjunctival graft to cover the surgical site. These grafts incorporate into the cornea at the site of the abscess forming a dense scar in a few weeks. The goal is to preserve the vision and globe by provide structural support to the cornea and bring in blood supply to facilitate healing of the weakened and diseased tissue. 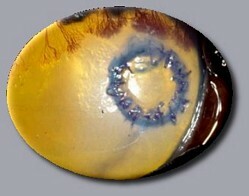 Healing of a corneal stromal abscess with or without surgery will result in a scar on the cornea. The size and location of the scar will dictate the degree of vision impairment (if at all). The performance of your horse may or may not be affected by the corneal scar. While treating for a corneal stromal abscess, the horse should be kept in a darkened stall with limited exercise. Hay should be removed from overhead racks and fed on the ground. An Eye Saver Mask can be used to protect the eye self trauma and from fly strike. In many cases, frequent medication application can be performed with ease by the placement of a subpalpebral lavage system. Please speak to your veterinarian or veterinary ophthalmologist if you are interested in having a subpalpebral lavage system placed.